According to Merriam Webster, the word resolution means “the act of finding an answer or solution to a conflict, problem, etc.” Being complex and evolving beings, I see how this can be a colossal set up for failure! Resolutions are intense, they are static and they tend to denote there is a problem. 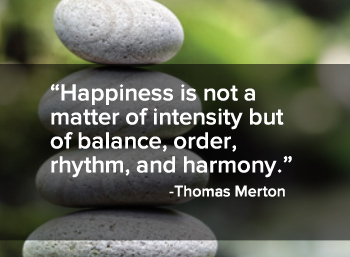 As the writer, Thomas Merton states, “Happiness is not a matter of intensity but of balance, order, rhythm, and harmony.” I couldn’t agree more and as we enter this New Year with busy practices, wild ambitions, family obligations, personal desires and very full lives, this point is crucial. The key to the ability to change and grow is by having a changeless sense of who you are. What does that mean, exactly? When you really dig in and begin to discover what you are about, what you value and why you do what you do, you also start to find that these core values are what make you, you. They are changeless and they are your key to real change. One of the best ways I have found to create balance and growth in both personal and professional life is to exclaim a creed or, a mission statement of sorts. Let’s face it, with every swipe of the mouse there are thousands of practice building, revenue driving and holistic marketing articles, blogs, communities and webinars to click on and peruse. However, having an individual creed helps each unique person anchor themselves and their lives to authenticity and personal fulfillment. When you have a personal mission, you are anchored to the vision and the values that direct your life. You have the essential direction to set long and short-term goals and the power of a written constitution that can guide every decision you make concerning the most effective use of your time, talent, resources and energies. I first wrote my creed by following Elke Siller Macartney’s advice from her book, Be Yourself Boldly. She writes: “First and most important is developing clarity of vision, a vision of what makes your heart sing. Second, synchronicity plays a big part. If the vision is clear, synchronicity can take over. Third, you must have a high sense of integrity, and always tell yourself the truth. Fourth, allow yourself flexibility.” Because our personal environments seem to be changing so rapidly these days, the flexibility part allows the wiggle room for reassessments, shifts and tweaks. As I have followed this, I have found that it gives me the space to continue to grow as an individual while the core of who I am, stays the same. So this year, I leave you with this challenge: instead of the intense and myopic resolutions, gently look inward, write your creed and let your life flow!